Recently redecorated and back on the market, Himitangi Hideaway, formally Rainbow Cottage has a new lease on life. Situated 1 block from the awesome Himatangi Beach, local shop, takeaway, kids play park and Cosmopolitan Club you could not get a better location to get away for the weekend or more. Sleeping 8 people in 1 Queen, 1 Dbl and 2 sets of bunks with the option of 2 more on a comfortable pull out sofa in the bunk room, there is plenty of space for the whole family or extended group. The privately fenced outdoor entertainment area has 2 large tables, bar leaner and stools and large BBQ. There is also a large back yard for off street parking or plenty of room for a game of back yard cricket. A private outdoor Bathtub is also available to soak away your worries while sipping a glass of wine while watching the clear night sky. Pets are by arrangement only, please contact to discuss. Fire wood and provisions in woodshed in back yard, key for shed on key ring. Out door Chimera on back deck please keep on concrete. table inside seats 6-8 when extended, outdoor seating for plenty. large backyard, big enough for a game of Kiwi Backyard cricket. There is a cleaning fee is included in the total price when you book. This is to cover the cost of checking the property and resetting it for the next guests. As guests you are still requested to remove all rubbish, wash and dry dishes and leave the property clean and tidy as you found it. We enjoyed the location and the comforts that the property offered to us. We were on a mission to have some R & R and were completely satisfied. Good location near beach, local shop and cossie club. The cars remained parked for 2 days as there was plenty to keep us occupied. Most enjoyable and we were well provided for in the house. We loved this place! Perfect for families, amazing kids playground down the road, all walking distance to shop, park and beach. Shop had everything we needed and we loved the fish and chips. There was plenty of room on the property for us all including the dog. The kids loved looking through the large selection of childrens books. We have stayed previously at foxton beach but we enjoyed Himatangi more. Thanks for the great feedback. We look forward to your next stay at our little slice of Paradise. Awesome wee Bach! All the amenities you need and extra kids loved the outdoor bath. So close to the beach and park we had a great stay. Having the cleaning fee was great for mum being able to just pack up and go I feel like I’ve had a holiday as well. Will be back! We were pleasantly surprised by the bach. Very neat and clean and was one of the best we've stayed at. Beds were also clean and the duvets etc. were just right. 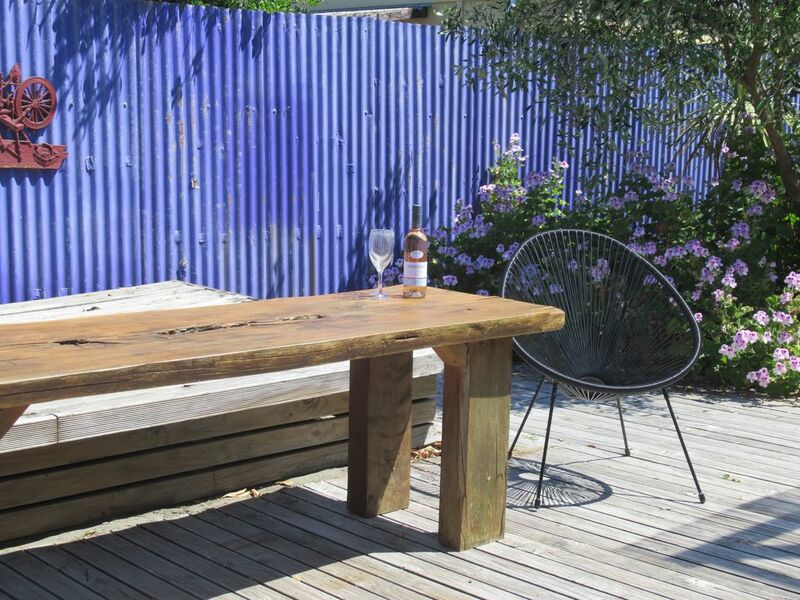 The deck was amazing with the beautiful sleeper wood tables. The outside bath was private and with the fairy lights and some candles was really great. Andrew's communication was friendly and good. Over-all we had a great time. We had a lovely relaxing stay. Plenty of space for a group. The outside space is nice and sheltered and the hot tub was a real treat. Walking distance to the beach and not too far a drive for supplies from Foxton. .5km walk to Himatangi Beach Motor camp if visiting friends or family.